Around this time of the year, kids get to learn a lot about recycling, planting and trash clean up in celebration of Earth day. I think it’s important to let them know we must do these things all year around and Earth should be celebrated every day. 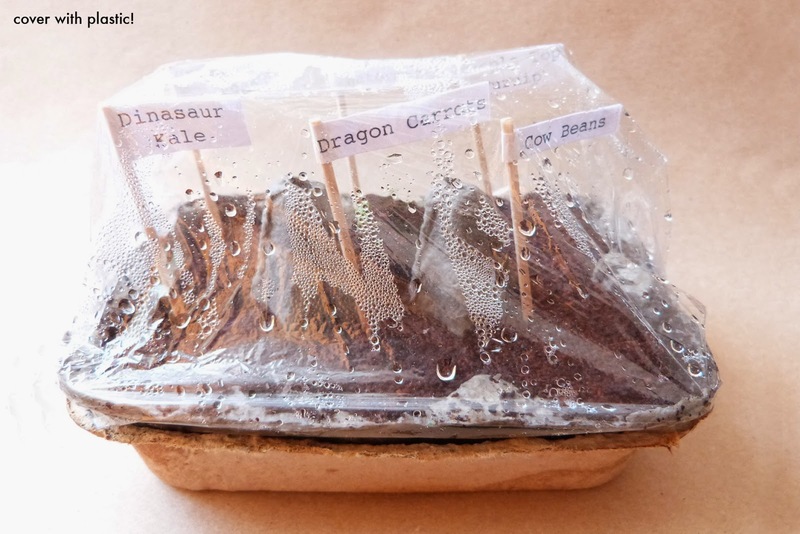 So, it doesn’t matter if you do this project on Earth day, this week or next month as long as your kids experience the joys and wonders of watching their own seedlings emerge. 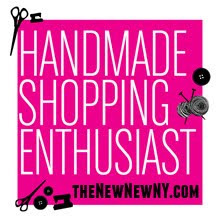 Plus, they’ll get a little lesson on recycling and composting on top of it all! Tip: to make the germination process a breeze, pick seeds that germinate easily such as beans, pees, carrots, squash, cucumber and pumpkins. Hard to start seeds might not even sprout and you’ll end up having a frustrated kid! 1. Separate the bottom part from the lid of the egg carton. Take the bottom part and poke holes in each cell using the tip of a pen or pencil. Those will be the drainage holes. Place the lid of the egg carton under the bottom part, nesting one under the other. Now you have your seedling tray. 3. Water each cell. Be mindful not to over water the seeds, a spray bottle comes in handy. 4. Use tooth picks and paper to make labels. 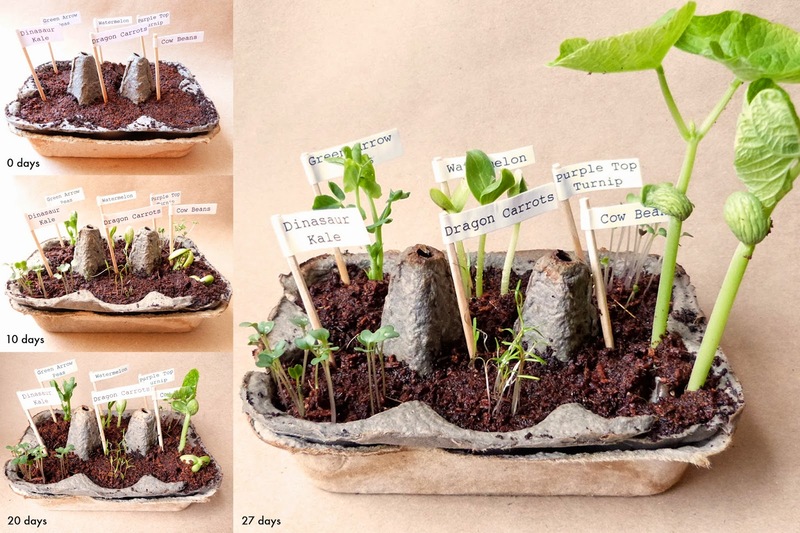 You can also use rocks or clothes pins to label the seeds. 5. Cover your tray with plastic wrap or a bag to create greenhouse conditions. 6. Place the tray by the window and watch your seeds grow! Keep soil watered and remove the plastic wrap when the first leaves appear. 7. When your plants have more than two leaves, separate each cell and plant it directly into the ground (or pot). 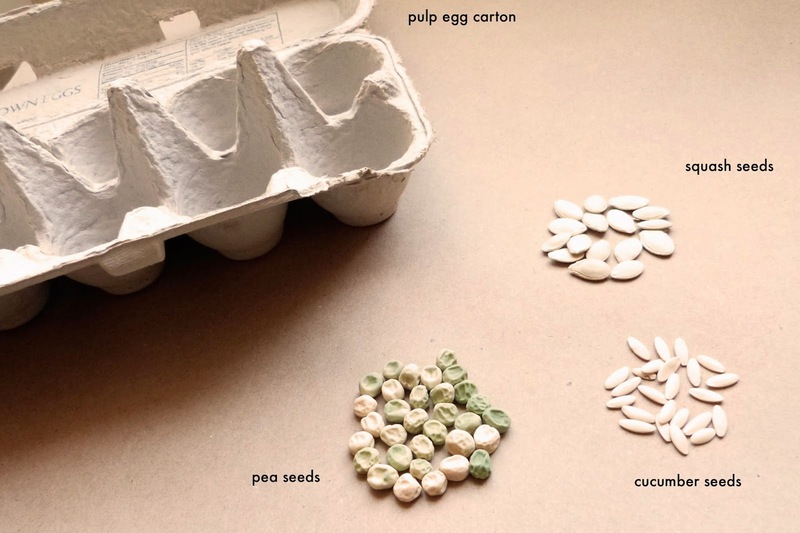 The pulp that the egg carton is made of will decompose and become compost. 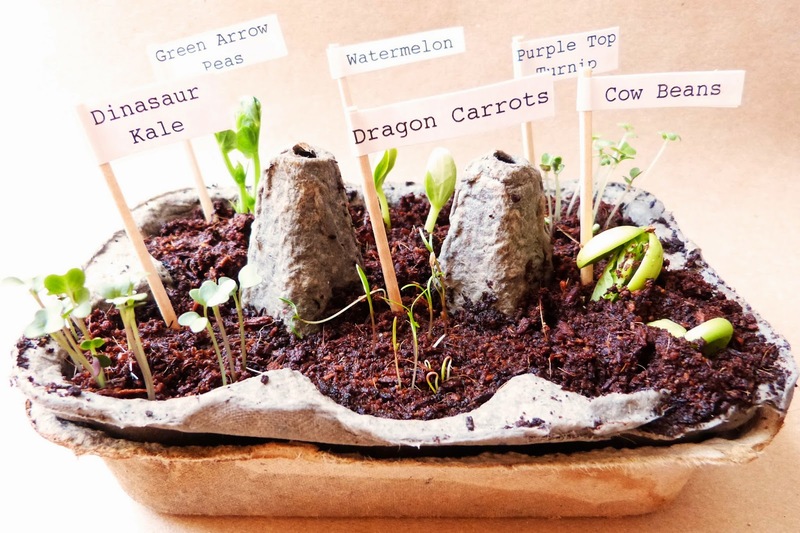 Doing this project is a great way to teach kids about the importance of planting and re-planting, recycling and composting. Explain to them why we should plant trees, how you are recycling the egg carton and how it becomes plant food. Let them have fun while you guide them. Make a photo journal, they’ll enjoy comparing the growth of the plants and making observations later on. I know I did when I was little and now I pass the experience on to my kids. Love that the names of the veggies are fun names as well! Dragon carrots! This is great info, Natasha! Purchasing sprouts can be very expensive, so this is a wonderful alternative.